I knew I would need a heartier breakfast for gym mornings, and I figure the extra calories and fat are ok as long as I’m working hard. Lately I’ve been getting headaches, probably from not having any caffeine or refined sugar these past few days. Thankfully they’re minor headaches and I expect my body to come to terms with the new eating habits soon. Protein and complex carbs are always good choices pre workout – so I’ve read anyway. I’m no dietician, but it makes sense to me 😉 I’m using some of the leftover roasted veggies that I made the other day to make this even more balanced and substantial. This recipe is for one serving, but it’s easily doubled, tripled, ect. Verdict: I worked out for two hours after having this breakfast, and it made a huge difference in my stamina, reaction time and my overall “good” feeling. I wasn’t sluggish or tired and I felt great. After my workouts I eat an apple and 1/4 cup of raw walnuts to refuel so I’m not starving until lunch time. During the day I have more energy, I’m never starving and my body just works better – I’m loving it! Thanks for reading, enjoy! 1. 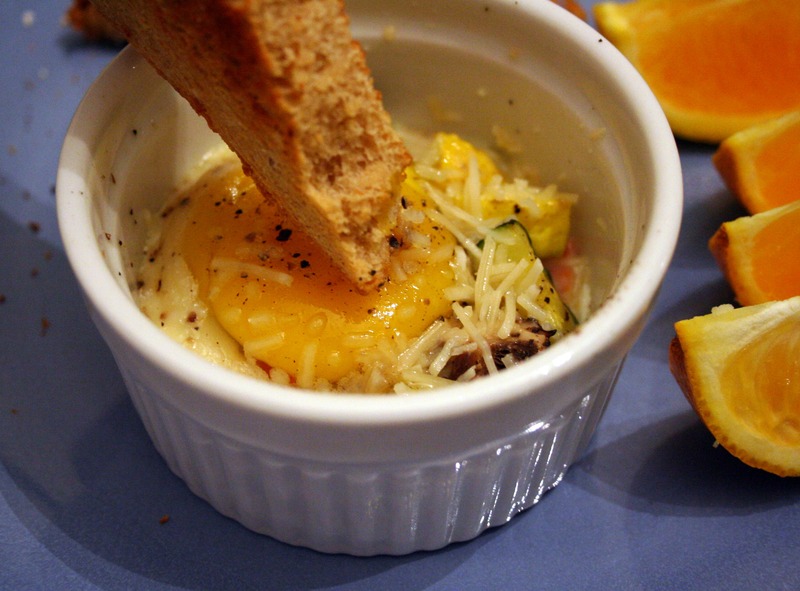 Preheat oven to 350 degrees, lightly grease your ramekin. 2. Place a few TBSP of your preferred add ins, crack and egg and drop it on top. Bake in the oven 10 – 15 minutes or until just set – if it looks fully cooked in the oven, it will be over cooked later. 3. Serve with fresh fruit and whole grain toast, enjoy! This looks lovely. 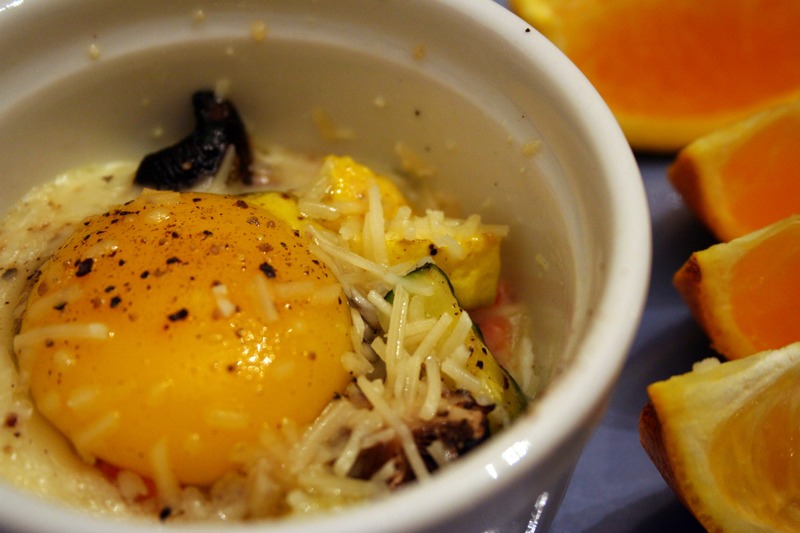 I recently blogged a spinach egg bake, I love doing little things like this so much. I find they take a surprisingly long time to cook actually. Thank you – and it takes little time to prepare which is great for our busy school mornings 🙂 I love your idea of spinach with eggs, I might have to try that. I’m always looking for more ways to make the most nutritionally dense meals.